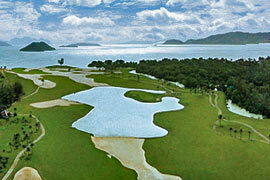 This medium length par 5 requires two well placed shots to give players a comfortable third shot into the island green. To get to the green in two, a tee shot down the left side over the sandy waste is needed to give the best angle into the green The island is shared by the green for hole number five and large enough to tempt even the most conservative golfer. The green sets up as an island of grass in a sea of sand for this par 3. This golf hole is best played with a slight draw around the front greenside bunker, especially if the pin is situated back left. For the golfers that push the ball out to the right, they will find a very tricky pitch back to the green from an uneven lie. This par 4 plays back to the island green from island tees in a huge sandy waste. The best tee shot is to hit far enough to get above the strong elevation change that runs through the middle of fairway. Golfers hugging the side of the fair way will have the best angle into the green and take advantage of the green contours. Those with shorter drives may want to lay up down the left side of the lake for their second shot. A bunker to the right and a canal to the left protects both sides of this par 4 fairway. Long hitters will find a narrow fairway to contend with and may not choose to use a driver. The green is separated down the middle by a spine requiring the second shot to land on the same side of the spine as the pin in order to avoid 3 putting. The longest par 3 on the course. The lake is very far from the green and shouldn't present much trouble. The best line is left to right, starting at the bunker on the left. It is also possible to play a bump and run shot and work the ball to the back right area. Missing the green to the left will mean that a deep fairway hollow has to be contended with. This hole has no bunkers in play from the tee, but requires those playing this par 4 to choose to aim either the left or right of the centrally placed group of trees. Shots down the left side will have the easier approach to the green with a shorter iron. Those on the right will have to hit far enough beyond the trees but will then have a clear shot to a well protected and shallow green. This medium length par 5 will require a ball hit over the carry bunkers on the left side to be in a position to go for the green in two. A small lake and another carry bunker at the second landing create the need for a right to left ball trajectory to set up the best shot to the green. A more conservative approach to the green can be achieved down the right side of the fairway. This long par 4 will require a tee shot to be hit as far as possible in order to have the best angle into the green. Those shorter hitters may catch the elevation change and will have to come into the green over bunkers with their second shot. A relatively easy par 3 which requires a right to left approach from the tee to the front of the green. Try not to hit too long as there are fairway hollows beyond the green. The longest par 4 on the course, which requires 2 long shots to have a chance to make par. Aim to the left side of the fairway close to the bunkers to give the shortest and best angle to the green. A lake down the right side and a deep hollow on the left protect the green. The longest par 5 on the golf course. It requires two long hits in order to reach the green. The best shot is to the left of the fairway to cut distance and to have a good set up for the second half of the hole. Careful club choice is necessary for the second shot to leave a perfect distance for the third shot into the green. The green is slightly convex and will require a well placed third shot to stay on the putting surface. This is short par 4 but needs to be respected due to the very tricky green complex. It will depend on the pin position as to which side the green should be approached from and the best tee shot will be played from the opposite side of the fairway from the pin position. The shortest par 5 on the course requires a left side fairway shot for the best angle to enable you to get to the green in two. A more conservative approach is to play short of the right approach bunker with a shorter pitch shot. A tricky up and down will follow if the ball is caught in the left greenside bunkers. The shallow green has a canal beyond. This short par 3 requires a well placed tee shot to a relatively narrow green guarded by bunkers and the canal. The green slopes from right to left and will accept a high left to right shot trajectory as the best approach angle. The shortest par 4 on the course that requires the tee shot to be placed down the right edge of the fairway as no bunkers are present and to avoid the deep hollow on the left. The green complex is slightly convex on the left side. If playing to the right green complex, the player will need to place the tee shot between the lake and the bunker in the middle of the fairway for the angle into the green. If playing to the left green complex, there is a choice to carry the middle fairway bunker or place the tee shot as close to the left fairway bunker for the best angle and shortest distance to the green. The green contours allow for a second shot to be placed short and left of the green.